Dark matter is supposed to be the mysterious force that keeps galaxies together in their globular clusters. However, an international research team announced that they observed, for the first time, a ghostly galaxy (NGC 1052-DF2) that looks to be totally devoid of dark matter. Dark matter continues to mystify astrophysicists as a new galaxy, 65 million light-years away, filled with stars, but with no “apparent” dark matter has been discovered. Making up more than 85% of the matter in the observable universe, dark matter is still a no-show in every scientific experiment that aimed to detect it. CERN’s Large Hadron Collider and other detection facilities have also failed to spot the ghost particle of dark matter. With its observable effects on the cosmic scale, scientists think that dark matter’s “elusiveness” boils down to a particle that has weak interaction. This weakness to interact makes it difficult to directly detect the particle. Based upon speculation that this particle exists, several dark matter detectors have been built around the world. For example, the XENON Experiment operates the most sensitive DM detector at the Laboratori Nazionali del Gran Sasso in Italy. The detector (XENON1T), which is put underground to shield it from radiation, looks for WIMPs (Weakly Interacting Massive Particles). WIMPS are one of the prime candidates for dark matter. XENONIT ran a 30-day test and, though the elusive WIMPs didn’t “show up”, scientists are confident that this was still “the best result on dark matter so far”. Always in Italy, DAMA (for DArk MAtter) is a project focused on dark matter research. One of DAMA’s several experiments is the DAMA/LIBRA project (Large sodium Iodide Bulk for RAre processes) which has been working for the last two decades to find direct evidence that proves dark matter exists. Recently, DAMA researchers claimed they have managed to trap the sought-after dark matter particle. Where’s all the Dark Matter? Dark matter is supposed to be the mysterious force that keeps galaxies together in their globular clusters. However, an international research team announced that they observed, for the first time, a ghostly galaxy that looks to be totally devoid of dark matter. 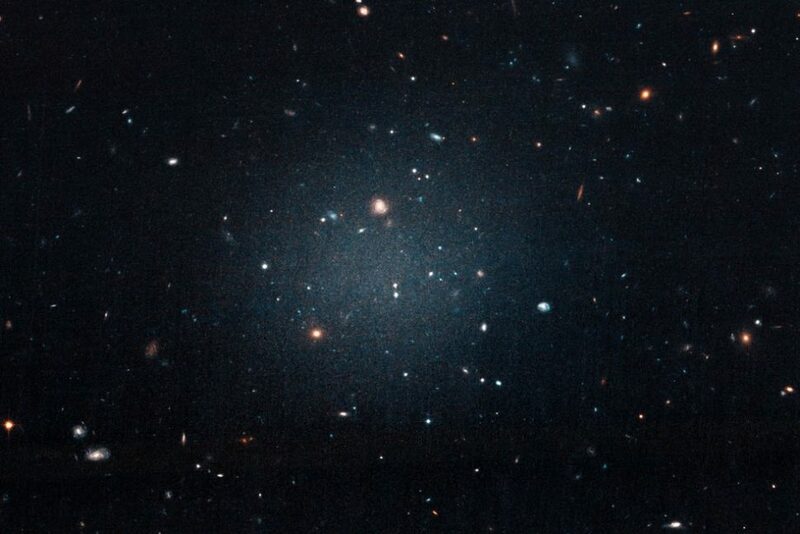 Data about the galaxy named NGC 1052-DF2 suggest that it has 1/400th the expected amount of dark matter. Researchers took evidence from four telescopes at different stages to come to their conclusions: the Dragonfly Telephoto Array (New Mexico), the W.M. Keck Observatory (Hawaii), NASA’s Hubble Space Telescope, and the Gemini Observatory (Hawaii). In a stark contrast to the missing dark matter news, two years ago, astronomers have discovered Dragonfly 44, a massive galaxy that’s mostly (99.99%) dark matter. Although a concept still theoretical, from lack of a direct evidence of its existence, dark matter is an essential element in physics without which our understanding of the formation and evolution of the universe wouldn’t hold. How should we rethink current physical models that incorporate dark matter as a major cosmic force? It’s not that there is no dark matter connected to and neighboring the visible matter. It’s that the galaxy is not well defined enough to displace the dark matter to such an extent that it forms a ‘halo’ around the galaxy. Please do not dismiss the idea until you see the justification. By playing with the constants, this equation can be fitted and tested against the data of galactic motion. It means that at a certain distance, gravity will reverse and the galaxies will be pushing against each other. This pressure against each other does away with the need for dark matter or dark energy in cosmology. So the equation can be tested against current data to see if it fits. This equation also predicts that galaxies near the edge of the universe will be deformed — concave with the concavity pointing towards the center of the universe. If it cannot, then the theory can be dismissed. Either way, I would like to know — but I would not be convinced with a simple “absurd!” or dismissal unless it has been tested out.